With its semi aero tendencies, the Campagnolo Scirocco is just what you need to help you out on longer training sessions. It holds its own and then some, giving you power and speed when you need it the most. As surprising as it may be, the Campagnolo Scirocco is actually quite light. The alloy hub and the aluminum pin help to keep the weight of the wheelset down. When compounded by the stainless steel aero spokes and the anti-rotation system on the spokes, you have yourself a semi-aero bike. What all of this is building up to, of course, is the speed which we were eager to see come to fruition during our ride. Well, we were certainly not disappointed. The wheels pick up well leading to acceleration quite fast. Not only that, it is capable of maintaining this speed quite well. This, in part, is thanks to the G3 geometry of the wheel. 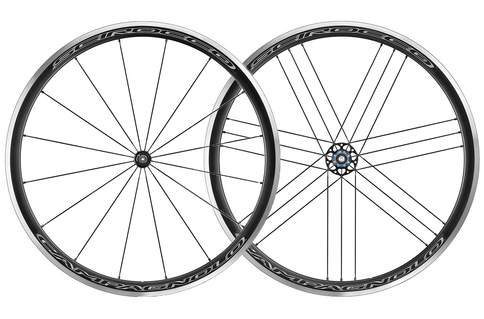 This means that there is a smoother transfer of power to the wheelset. It also helps to knock off any vibrations that may occur at a certain speed. As mentioned, Scirocco fits the bill as a training wheelset, especially when you are planning on those longer rides. It is durable and responsive, not to mention, will make sure that you achieve those speeds. As an actual competition wheelset, it may perform less ideally. This is not just due to the limitations in speed but also due to the difficulty with tire replacement. This job can get a little fiddly and can be quite frustrating during a race. That being said, you will certainly be pleasantly surprised by the Scirocco and will grow to love it the more than you ride on them. If you want a wheelset to improve your training days then the Campagnolo Scirocco is all that you need. This wheelset is affordable, produces results, and is also quite stable, especially on longer rides.